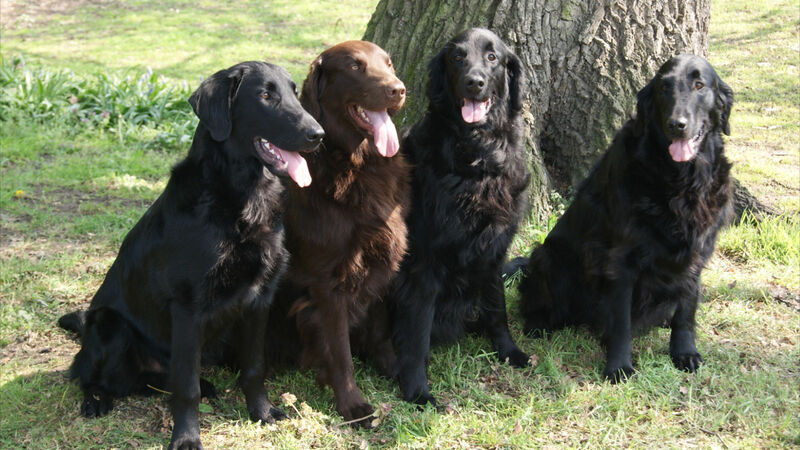 Cheerful is a great term to describe Flat-Coated Retrievers. These extremely friendly dogs have a number of benefits, and they are ideal for those who want a playful, loyal companion. Perhaps best of all is the fact that these dogs are also very easy to train. There are a number of aspects to owning one of these dogs that are well worth keeping in mind. As the name of the dog might imply, this breed is particularly fond of retrieving things. Many of them enjoy retrieving items from the water most of all. This is a perfect dog for anyone who wants a companion who is ready to help or play. 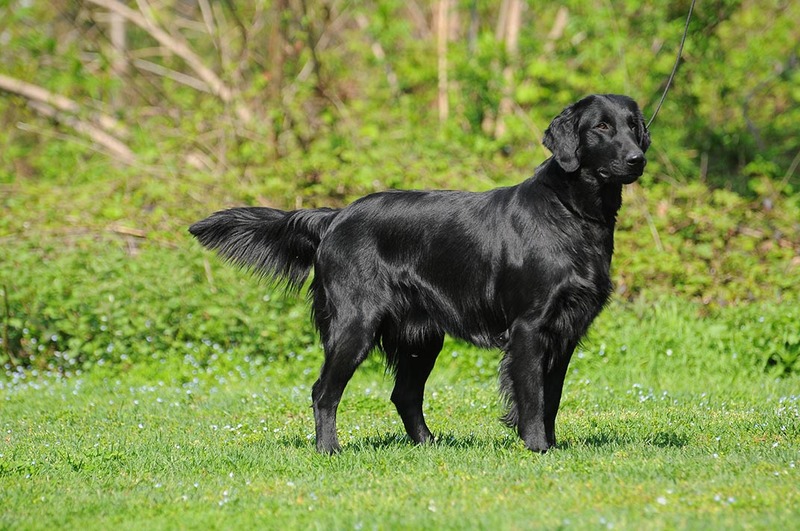 One of the first things you are going to notice about the flat-coated retriever is that it has a rectangular body. This is emphasized by the breed having what many describe as a longish, one-piece head. Their eyes are dark brown or hazel, and they tend to be shaped like almonds. These eyes give the dog an appearance that suggests kindness and intelligence. Their small ears are thickly feathered, and their coat is not only quite shiny, but it is also moderately long. The color of the coat is generally either solid silver or solid black. Due to the coloring of their coats, this breed of dog is particularly susceptible to overheating on warm days. Owners should take special care to keep this in mind. 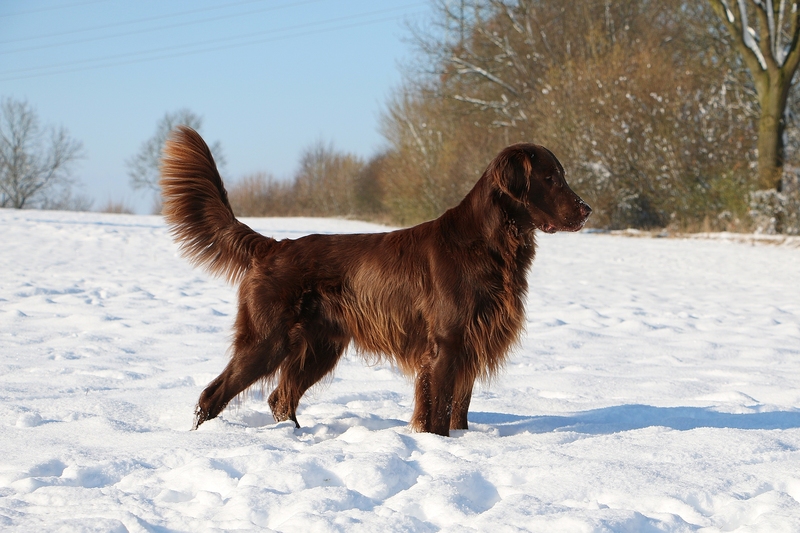 The coat of the Flat-Coated Retriever is great for dealing with cold waters and cold weather. It can also take the use of a rough brush for grooming needs. One nice thing about this breed is the fact that they only look like their coats are high-maintenance. Simple weekly brushing will go a long way towards keeping this dog comfortable and happy. Removing dead hair, while distributing the oils of its skin, is something you will always want to remember to do. Furthermore, since this breed likes to spend so much time in the water, you probably won’t have to worry too much about bathing. Obviously, if your Flat-Coated Retriever goes swimming in the ocean, or in a swimming pool with chlorine, you will want to make sure to rinse your dog off afterwards. Trimming the ears and feet on occasion will be a good idea, if you want your dog to look neat on a regular basis. Some call the Flat-Coated Retriever the Peter Pan of dogs. Spend a few minutes with one, and it is not going to be difficult to see why this is the case. This breed is notable for being extremely friendly, and for being incredibly easy to get along with. This is perhaps one of the most “optimistic” breeds you are ever going to find. They are always happy, and they are always particularly pleased in the company of humans. They are also quite good around other dogs, although results can be somewhat mixed around cats. Some Flat-Coated Retrievers are just fine around cats, while others are not. It will simply depend on the specific temperament of your dog. These dogs are also noted for being good around strangers. The only problem you may ever encounter will come down to their overeager nature. This is definitely one of the breeds that will want to jump up to greet family and new faces alike. 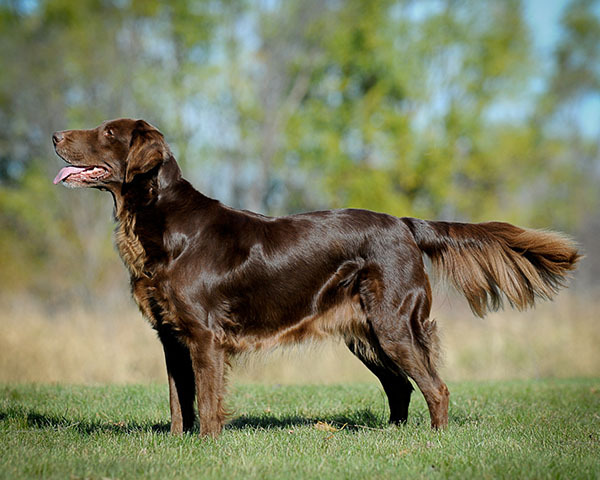 This is something you can obviously work on in training, but keep in mind that Flat-Coated Retrievers have what is known as a prolonged adolescence. This means that long after other types of dogs have settled down, your Flat-Coated Retriever could still be going after life like a newborn puppy. Again, this is something you can work on with training. Another nice feature with this breed is how easy and fun it is to train. These dogs love to be engaged, and they love to be challenged. Training them can be a little challenging, given their rambunctiousness, but it should still prove to be pretty straightforward. Just keep in mind that they need consistency in their training, and that they are very fond of praise and rewards. At the end of the day, they just want to make their owners happy. Because of their energy, these dogs are not suitable for apartments. Nor should they be left without any stimulation for hours at a time. 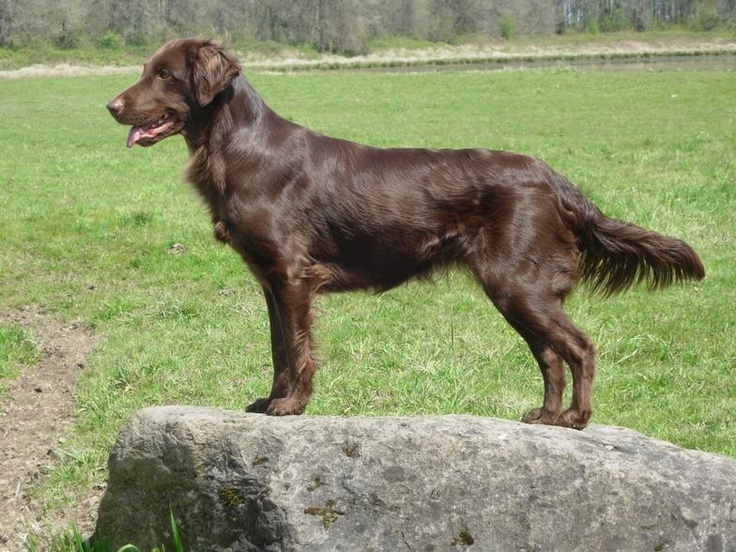 Newfoundlands, setters, sheep dogs, and water spaniels all played a role in the creation of the Flat-Coated Retriever. Originally known as the Wavy-Coated Retriever, the dog was extremely popular up to the turn of the century. The breed was recognized in 1915, but the popularity of these dogs would eventually be eclipsed by Labs and Golden Retrievers. At the end of the Second World War, the breed had almost disappeared. Thankfully, dedicated owners worked to ensure the breed continues to this very day.